On the 28th anniversary of the massacre of 30,000 political prisoners, we salute the pure souls of those fearless warriors who are the beacons of Iran's freedom and resistance. They rose up and defended their identity and emancipating cause with the utmost pride. That is how they laid the foundations for a radiant tradition that has the refusal to surrender as its hallmark. Those heroes, especially the young girls of the People’s Mojahedin Organization of Iran (PMOI/MEK), had the perpetrators of the massacre pleading and exhausted, as they themselves have admitted. Khomeini sought to annihilate the generation of the PMOI in order to preserve his regime's rule. Yet nothing has remained of his regime except a doomed corpse submerged in blood and corruption, which is a disgrace to Iran's history. In contrast, the PMOI generation, their ideology and their ideas thrived and the victims of the 1988 massacre became the invincible conscience of the nation. As Massoud Rajavi reiterated in the 1980s, "Humanity always reveals its secrets in glorious myths and epics; the secrets of its conscious and free existence… These genuine epics, which leave the most tangible and momentous consequences, are created in such confrontations and are indeed accompanied by tremendous sacrifice and suffering." The steadfast perseverance of the massacred PMOI and other freedom-fighters is among such epics. Their voices can be heard in the endless questions of students and youths who challenge the mullahs' murderous regime over the 1988 massacre. They can be heard in the messages of political prisoners from across the country whom rise to support the resistance for the overthrow of the religious tyranny. And the cause of those martyrs forges ahead, lively and spirited, radiating in the perseverance of the PMOI in Camp Liberty. 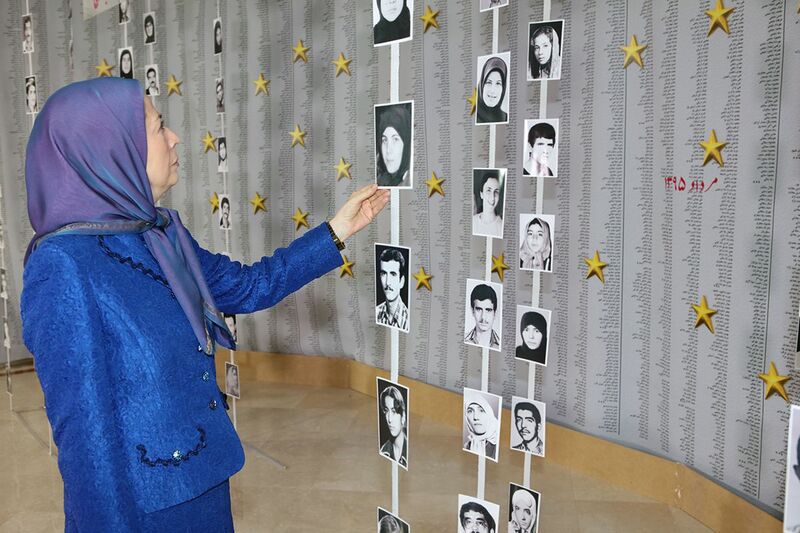 I hail my compatriots, members and supporters of the Iranian Resistance, and the families of martyrs and political prisoners, who commemorated the victims of the 1988 massacre and demanded justice by staging various activities, including hunger strikes, starting in the final week of July. I express my gratitude to PMOI supporters inside Iran for their activities, and to our fellow compatriots who held three-day hunger strikes and demonstrations in the UK, the Netherlands, Germany, Switzerland, Italy, Belgium, Canada, Norway, Sweden, France and the US. You showed that those heroes still echo the cry of freedom in Iran even after over three decades. Their names, their innocence and their glorious and unwavering endurance have shaken up the ruling religious tyranny and call for the freedom of our enchained nation. The publication of an audio recording of Mr. (Hossein-Ali) Montazeri's meeting with four officials of the regime responsible for the 1988 massacre has sent shock waves throughout the regime. This is a very important document attesting to several basic realities: First, the audio clip contains explicit confessions by those responsible for the massacre regarding their participation in an ongoing genocide. It shows that Khomeini and his entourage contravened even their own procedures and routines and were directly involved in the massacre. It also indicates that the religious tyranny solidified the foundations of the next repugnant Velayat-e Faqih (absolute clerical rule) as a result of this genocide. The fact is that Khamenei's rise to power (as the next supreme leader) was not the outcome of Rafsanjani's recommendations to the Assembly of Experts or their meetings. The scheme was concocted during the massacre of political prisoners, which was orchestrated by the highest officials at the time, namely Ali Khamenei, Ali-Akbar Hashemi Rafsanjani and Ahmad Khomeini. Another point clearly made by Mr. Montazeri is that Khomeini had been deliberating about the massacre starting three or four years before it actually occurred and as his son repeatedly stated, he had decided to execute all “the Mojahedin, including those who read their newspaper, to those who read the magazines, and those who read flyers." Therefore, those who over the past years have argued that the reason for the massacre was the Operation Eternal Light have indeed assisted the regime politically and have justified its crimes. Khomeini feared the PMOI’s deep roots in Iranian society and the movement's strength and determination. In a letter he wrote a few months later to Montazeri, Khomeini explained the reason for the latter’s ouster as heir to the supreme leader: "It has now become clear that after me, you will give up this country and the dear Islamic revolution of Iran's Muslim nation to liberals and through them to the (Mojahedin)." Another reality is the dreadful and vast numbers of those massacred. The methods of the death commissions were so insane in various cities that in talking to Mr. Montazeri, the henchmen --who had thousands of people executed in Tehran-- claimed to be moderates who opposed such extremism. Nevertheless, a few months later, Khomeini adopted a policy of denial and total rejection of the truth. In a letter to Mr. Montazeri, he wrote that "the PMOI took advantage of your words and writings to make a big deal out of 'a very limited number' of those executed and you can see what a priceless service you have done to the Arrogance." Therefore, since the outset, the policy of denying or minimizing these crimes or attributing them to the PMOI itself, was formulated by Khomeini personally. Today, however, many of those deceits and lies have been foiled and the innocence of the PMOI and the legitimacy of their resistance glow brighter than ever. The regime's officials and spokesmen are concerned that "the country's youths have become skeptical." They say, "There are efforts to change the society's outlook on the Mojahedin," and "there is a suspicious current that deliberates on whitewashing the PMOI and its deeds…" They also say, "The revival of the Mojahedin and portraying them as innocent is very dangerous." Today, many regime officials and even those directly involved in the massacre try to pretend that they were not aware of the massacre. They try to avoid taking a stand on this issue. Some of them slander the PMOI to evade the main question. And yet, there are some murderers who defend the massacre more brashly than ever. All of them, however, believe that the public's widespread reaction to the recent publication of the audio recording is tantamount to the end of their regime. The time has come to launch a movement to obtain justice over the massacre of political prisoners in Iran and to expand it everywhere and by any means possible. The litigation movement must, as a first step, seek to indict the mullahs' supreme leader Ali Khamenei. Khamenei and his accomplices are criminals because they are the highest officials directly responsible for the 1988 massacre of political prisoners. They are criminals because they concealed information and documents about this carnage. Khamenei and his accomplices are criminals because they have repressed the families of the victims of the massacre for the past 28 years. They are criminals because they have constantly backed the perpetrators and those directly responsible for the massacre and have appointed them to senior political and judicial positions. The movement to obtain justice for the victims of the 1988 massacre must hold the Velayat-e Faqih regime accountable for the secrets it has concealed on this horrendous crime. The regime's leaders must release the complete list of those massacred. They must announce where the victims are buried and where the mass graves are located. Yes, it must be clarified what was the account of those who were arrested simultaneous with the massacre and executed at once? What are the stories of Ahwaz Prison and Dastjerd Prison in Isfahan? What are the catastrophic stories of the prisons of Shiraz, Mashhad and Tabriz? What is the story of mass executions of those arrested in western Iran allegedly for supporting the National Liberation Army and executed shortly afterwards? What is the story of those who wanted to join the PMOI in cities as acknowledged in a recent interview by Moussavi Tabrizi, Khomeini's criminal Solicitor General? The movement to obtain justice is also a campaign to expose the identities of each and every one of those who made the decisions and who carried out the executions. Who were the death commission members in the provincial capitals? What unfolded during the meeting of the three heads of the regime’s branches where they decided to massacre non-PMOI prisoners? What were the decisions of the State Exigency Council which on Khomeini's order took charge of determining the fate of prisoners on September 27, 1988? And how many more prisoners were hanged? And finally, the movement to obtain justice is a relentless campaign by our compatriots and all supporters of the Iranian Resistance for the international prosecution of Khamenei and other regime leaders for committing genocide and crimes against humanity. The United Nations and the UN Security Council must adopt political and legal arrangements for the international prosecution of leaders of this regime on the charge of committing crimes against humanity. A formal international condemnation of the 1988 massacre is a necessary step towards ending all mass executions in Iran, an episode of which was recently repeated in the concurrent execution of 25 Sunni prisoners. Yes, we need to plead for justice for the victims of massacre, for the pain and suffering of bereaved mothers and fathers, and for the enormous human and moral toll inflicted by this regime on our nation. The movement to obtain justice demands the names of the victims, the locations of their graves, the identities of murderers, and the prosecution of the regime's leaders. This is a movement that targets the pillars of the Velayat-e Faqih's tyranny and oppression. We call on all advocates of human rights around the world and everyone who respects human rights to join the people of Iran in their demand for the prosecution of the Iranian regime's leaders. This demand is, of course, coupled with the call for the freedom of our enchained Iran. On that day, our massacred heroes and all other martyrs will once again rise to revive the entire country in the life-giving breeze of freedom.